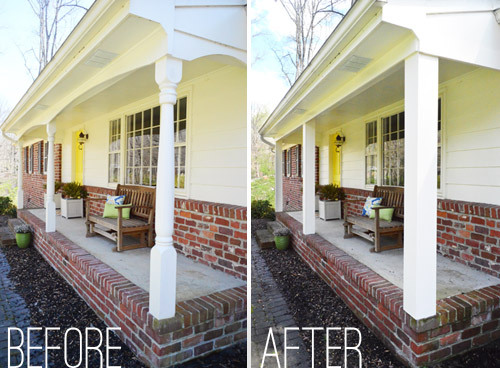 Updating front porch posts is one way to keep your home fresh and inviting. John and Sherry of Young House Love are passionate about home improvement and generous with sharing their tips. They took on this porch project to inject more of their own personality (clean, straight lines) into the front of their Richmond VA home. The problem was that John and Sherry's porch columns were colonial-style (curvy and scrolly) and they did not match the columns on their car port. Then add to that a scalloped header - definitely not a match for either John or Sherry's tastes. So they put their DIY skills to work to improve their front porch. Let's see how they did it. See the colonial columns and scalloped header on the Before? Now look at the After to see fresh straight lines. Let's see how John and Sherry tackled this project. 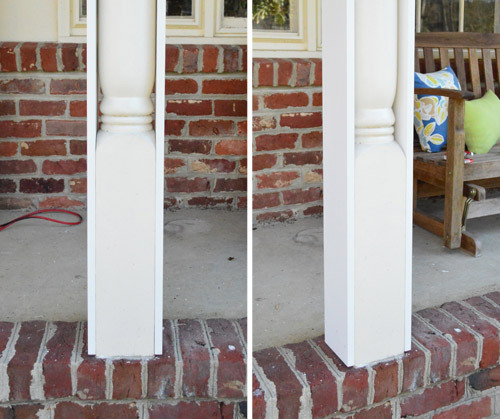 They are so awesome for sharing their pictures with us so you can learn how they updated their front porch columns. First, they tackled the scalloped trim / beam. John used a utility knife to score the seams where the scalloped trim met the porch ceiling. He did this to minimize the damages to the many layers of paint. Then he used a rubber mallet and a crow bar to gently loosen the remove the scalloped trim. Once that was off, they replaced the curved trim with new straight trim. They used a 1 x 3" piece of pine wood (already primed) in its place - attached with glue and nails. Later in the project, they decided that the 1 x 3" trim didn't have enough weight to it, so they put up 1 x 6" pine board to give it more depth. While this project is not difficult, use tools safely and ask for professional assistance if needed. This is where John says "the fun began" - covering the colonial-style wood posts with new wood to give them a boxy, chunky feel. Realize that they could have removed the existing columns and replaced them with brand new square porch columns. But that's a bit more involved and expensive as well. John and Sherry covered their existing posts with 1 x 6's on opposite sides and then 1 x 8's on the remaining two sides (fronts and backs). The only thing they had to trim was the length as their columns were not quite 8 feet tall. They were very fortunate that the 1 x 6's fit just fine! They used strong wood glue and 2" nails at the top and bottom (with a nail gun). Then John added a few screws for extra stability. Precautionary Note: If your existing wood porch posts are hollow and you plan to box in your front porch columns in a similar way, Dave and I suggest you add means for good ventiliation. See our ventilation tips. Otherwise you risk the chance that they may rot from the inside out. The last step was to caulk and paint. John said that it pays to really caulk the seams well. It might be boring and tiring but it's worth it to seal everything well to prevent moisture from rotting the wood. And of course, it makes your job look much more professional. Important to remember: Use caulk that says it is paintable. The wood that John and Sherry used for this project was already pre-primed so all John and Sherry had to do was to give it a good coat of paint and the job was done. 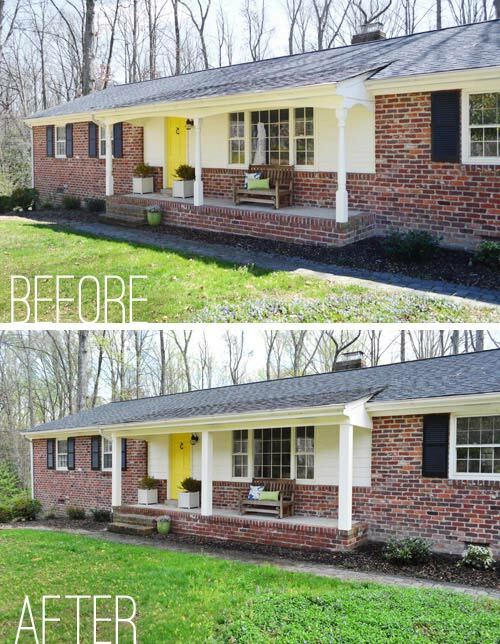 Very nice upgrade indeed: from colonial porch posts to more chunky, square columns plus an updated header / trim piece to give their ranch style home a mini face-lift. John and Sherry are the husband-wife team who write the wildly popular blog "Young House Love". They share their DIY experiences as well as their fun life with their daughter, Clara, and their dog Burger. Our warm thanks to them! If updating front porch posts is a project you want to tackle, visit John and Sherry's blog to see more details. One stop to their blog and you will probably be addicted like me to their zany stories and practical how-to wisdom. Our warm thanks to John and Sherry for sharing their latest porch project "updating front porch posts" with us.